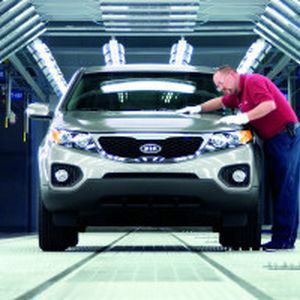 Kia Motors informed about the completion of its welding plant, located in Pesqueria, Nuevo Leon, surpassing the 90% of progress. The building will occupy a 37,200 square meters surface and it is expected that it starts with production tests by mid-October. The plant's main activity will be focused on the welding and assembling of car bodies, which should have the precise and safety dimensions that every automobile requires. The welding equipment has 15 production lines where near of 138 different pieces will be assembled for the car body. Kia has invested in more than 300 robots to develop a 100% automated process, in order to guarantee the quality of the cars. The Company invested a US$1 billion to build its Pesqueria's plant that will reach an annual production of up to 300,000 vehicles, 20% out of which will supply the Mexican market and the 80% remaining to supply North and South America.